LOCATION DETAILS: To the right (east) side of I75 going North after where I275 exit to St. Petersburg crosses, about 10 miles north of there near Little Manatee River State Park. There is a small bridge on I75, I witnessed the sighting either before or after the small highway bridge near Manatee River State Park. I was driving on the far right lane going about 65 or 70 miles per hour. I hope no one tries to hurt it or capture it. Maybe it is best not to post the exact location online for the benefit of the creature. OBSERVED: I, a female lady, was driving on a clear day on I75 in the afternoon on a spring day from Sarasota to Tampa going north 65 to 70 miles per hour on the far right lane. This would be on the east side of I75. I had to take an exam in Tampa the next day so I know the exact date I was traveling. My window was slightly open on the passenger side to let the fresh air in. I was driving on the far right side of the highway in a heavily tropical wooded area when I saw what I first thought was a man walking fast about 50 feet away from the highway in like a grassy meadow with thick brush or tropical woods behind him. As I got closer I saw that it was not a man but a creature that looked like a man but with (approximately) three inch long brown hair covering it's body from head to foot. When I was parallel to the creature it quickly went into the brush/wooded area and disappeared. It looked like tall thick brush or woods. 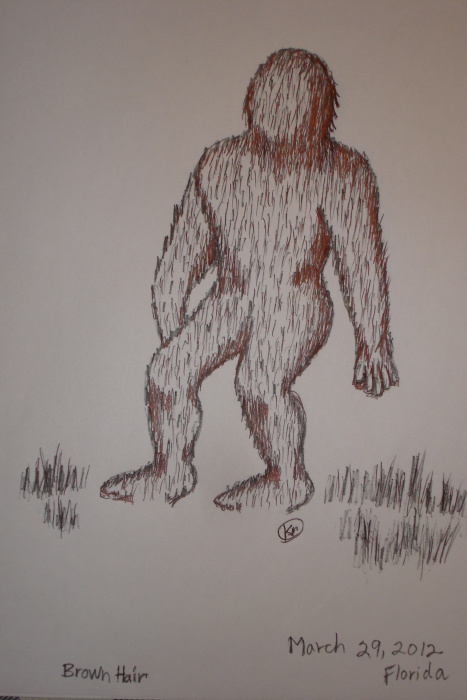 The creature looked like a male around I am guessing 6 to 7 feet tall with a thick body, thick legs, wide shoulders. I could see the brown body hair as it turned it's whole body all at once, bent its head, and went into the brush/woods. It was going north the same direction as me and walked quickly with wide steps with knees bent before it turned into the brush or woods. As I drove off I couldn't get over what I just saw. It happened in about 30 seconds. My car smelled like rotten eggs, sulphur, or just a strange awful odor for about 10 minutes after. I was not afraid. It did not look scary just really strange. It happened so fast and without warning. ALSO NOTICED: My car window was slightly open on the passenger side to let air in because it was a nice day out. After the sighting there was a terrible odor like rotten eggs, sulphur, or something bad. It took about 10 minutes for the odor to go away. OTHER STORIES: I had not heard of any incidents except the woman who sent in photos of apelike creature known as Myakka ape. The creature I saw did not look anything like those photos. What I saw looked more humanlike with a thick body covered in brown hair. It did not look like an ape. It did have a terrible smell. ENVIRONMENT: Heavily dense brush or wooded area, there was an opening about 50 feet deep with a meadow and then heavy brush/woods in the background. 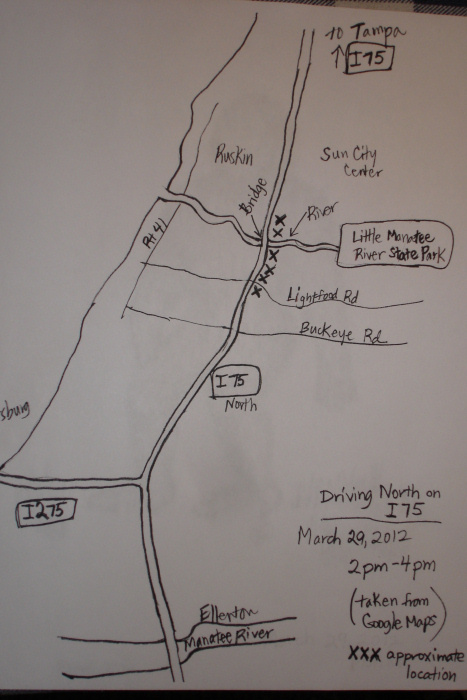 The witness included this sketch of what she saw that day, and after referencing some maps, pinpointed the location of the sighting. heading N away from her. It was a few feet from the woodline. As she neared the figure, she also noticed it was covered in brown hair from head to toe. It was walking with long purposeful strides, head and knees slightly bent. The hair was 3 inches long and definitely brown. She continued to describe it as much more manlike, than apelike. It had a round head like a man, and the arm length was normal, not long and down to the knees. But it was definitely covered in hair, and as she came up next to it, it veered off towards the wood line, walked into the thickets, and disappeared. The witness never saw its face. She said the thickets looked too dense for a man to just walk into. Even for this large animal.. She then noticed a very strong smell of rotten eggs/sulphur in the car, and had to roll the windows down for 10 mins before it finally dissipated. She never felt any fear as she was in a car and it never gave her a reason to fear it.